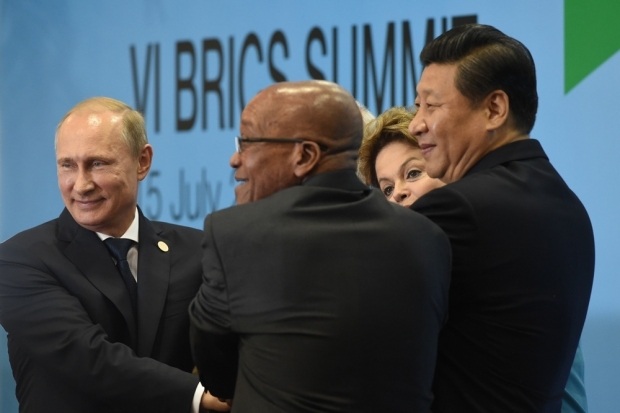 From left: Russian President Vladimir Putin, South African President Jacob Zuma, Brazilian President Dilma Rousseff, and Chinese President Xi Jinping pose during the official photo session of the 6th BRICS Summit in Fortaleza, Brazil, on July 15, 2014. Leaders of the BRICS (Brazil, Russia, India, China, and South Africa) group of emerging powers gathered in Brazil on Tuesday to launch a new development bank and a reserve fund seen as counterweights to Western-led financial institutions. Just a few weeks after Chinese premier Li Keqiang admitted that China was going through “growing pains” in its engagement with Africa, Beijing’s central bank chief, Zhou Xiaochuan, acknowledged some of the 2,500 PRC companies operating in Africa are behaving “not so good, not so satisfactory.” Zhou made the comments after signing a landmark $2 billion financing deal with the African Development Bank in what seemingly appears to be a new, more humble diplomatic approach to its foreign policy engagement on the continent.